An extra $460bn per year needs to be invested on the low-carbon economy globally over the next 12 years to limit global warming to 1.5C, a new paper says. Jocelyn Timperley takes a look. This is 50% higher than the additional investment needed to meet a 2C limit, the paper says. It is the first to assess the difference in investments and monetary flows between the two temperature goals of the Paris Agreement, the lead author tells Carbon Brief. The paper also finds a far faster increase in low-carbon energy and energy efficiency investment would be needed to limit warming to 1.5C. 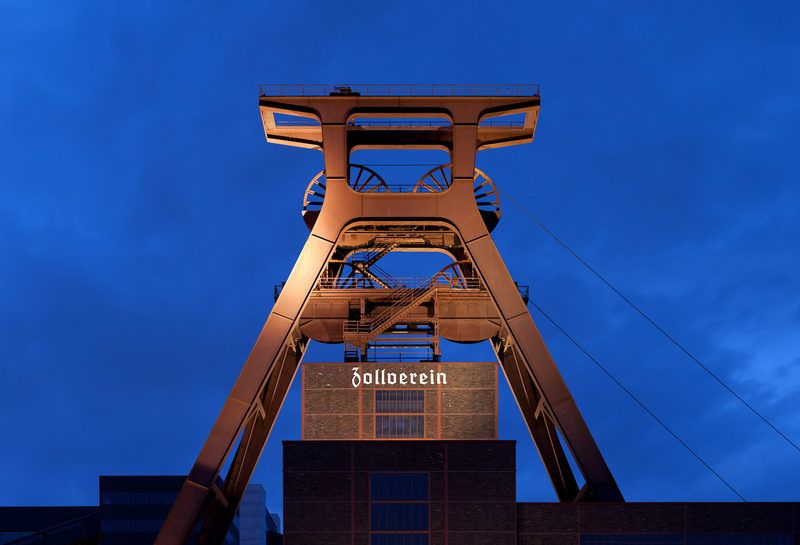 Meanwhile, coal investment would not change substantially between a 1.5C and 2C scenario, the lead author says, since a dramatic downscaling of coal investments is already required to meet the 2C goal. The paper, published in Nature Energy, aims to quantify the scale of financial flows that may be required to meet the overarching temperature goals of the Paris deal. It assesses how much would be needed for four scenarios. In the first, countries meet the targets laid out in their current individual climate pledges (“nationally determined contributions”, or NDCs). The second looks at meeting the Paris goal of limiting global warming to “well below 2C”. 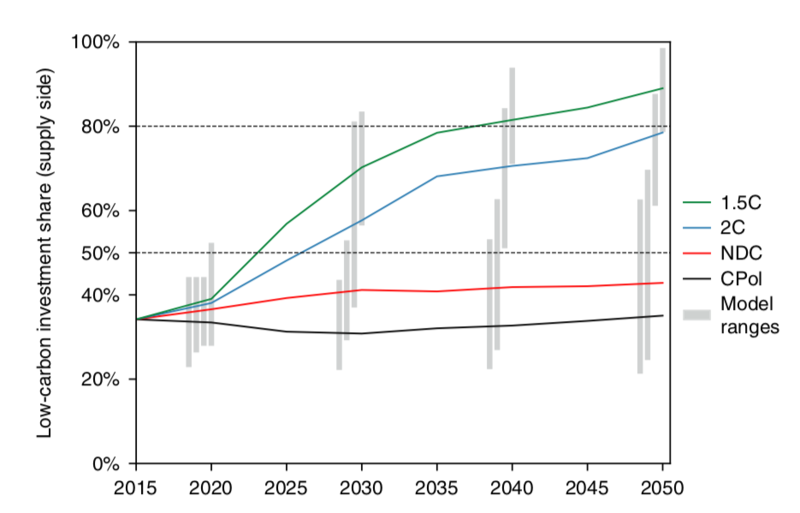 The third scenario considers a world where the aspirational Paris target of limiting warming to 1.5C is met. These are compared to a business-as-usual scenario with no further tightening of current climate and energy policies. The study combines the results from six different integrated assessment models (IAMs) to make its findings more robust. Each model represents the global energy system and the various mitigation options for the future in a slightly different way. All scenarios are in line with a “middle-of-the-road” future where social, economic, and technological trends broadly follow their historical patterns (SSP2). The findings show an extra $132bn investment in low-carbon technology and energy efficiency is needed between 2016 and 2030 to meet the NDC targets, compared to a business-as-usual scenario. The additional investments needed to meet climate pledges amounts to less then a tenth of the $1,700bn invested in the global energy system in 2016, according to the International Energy Agency (IEA). It is also comparable in scale to $100bn per year in climate finance that rich countries have promised developing countries to help fund their climate efforts. The chart below shows the results of the investment gap found by the study, as well as the much higher average annual investment needed up to 2050. This is due to the need for clean energy investments to accelerate beyond 2030, raising the annual average figure. Annual global investment gaps in low-carbon energy and energy efficiency in tightened policy scenarios, averaged up to 2030 and 2050. The scenarios consider a world where the NDC country pledges are met, and where the 2C and 1.5C temperature limits of the Paris Agreement are met. Source: McCollum, D.L. et al. (2018) Supplementary Material. Chart by Carbon Brief. For the 2C target, the extra annual investment needed in low-carbon energy and energy efficiency between now and 2030 increases to $303bn. Low-carbon investments would overtake fossil fuel investments as early as 2025 and grow rapidly thereafter, shown in the figure below. Around two-thirds of such supply side energy investments today are fossil-related, with the remaining third in low carbon. For the 1.5C target, an additional $458bn would be needed, the study says. This would mean a “step-change” in terms of the amount invested per tonne of CO2 avoided, it adds. It is also important to note that limiting global temperatures to 1.5C is expected to have economic advantages. One paper published earlier this year found per capita GDP would be 5% higher by 2100 if temperatures are stabilised at 1.5C rather than 2C. One thing that does not change substantially between the 1.5C and 2C scenarios, however, is the need to move away from unabated coal investments, says McCollum. Here, the difference going from 2C to 1.5C is even fewer investments into oil and natural gas, the paper finds. In some models, the authors found some limited room for natural gas investments with carbon capture and storage (CCS). Meanwhile, the share of investments going to electricity transmission and distribution, already currently around a quarter of all energy investments, will continue to rise. He adds that the same redirection of capital is needed in other areas, such as transport, industry and urban design. Investment in renewable energy has been on a plateau for several years, according to BNEF. The same money buys more capacity from price drops, but the trend is worrying and inadequate to the need. Also puzzling: as relative prices fall, you would expect the substitution to increase. What can explain this violation of basic economics? It may be the institutional and political power of the oil and gas industry (coal is rapidly losing the clout it had), reflected in deep-seated habits and prejudices of the financial sector. It’s important to keep up the pressure on the moneymen, through divestment campaigns and establishment reminders of stranding risk. “but the main thing is redirecting existing energy investment from fossil fuels to renewables” – won’t happen. Take a look at the share price of BP or Shell, take a look at the dividend then compare to another well run world leader in RES (Dong – Orsted). The difference is stark – RES is low return – fossil is high. Expecting ofssil money to move to RES would demand of investors their acceptance of much lower returns – I do not believe that this will happen.